With new optional features, such as creep control, throttle lock and work tool electrical harness, the 903D has the ability to run any number of tools. The Cat 903D compact wheel loader, compared with its 903C2 predecessor, features a 25 percent increase in both lifting capacity and travel speed, so customers are able to do more, faster, according to the manufacturer. Whether lifting a heavy pallet or sod or traveling from field to farm, the 903D is up to the task. With new optional features, such as creep control, throttle lock and work tool electrical harness, the 903D has the ability to run any number of tools. Available with either an open or enclosed cab, the 903D operator's station features a refined ergonomic design with a new multi-function joystick that provides fingertip control of the standard third-function hydraulic system. Whether lifting light material into a hopper or loading heavy pallets onto a truck, the choice of standard-lift or high-lift boom arms increase the 903D's ability to work efficiently in a wide range of applications, with buckets ranging in capacity from 0.8 to 1.3 cu. yd. (0.6 to 1.0 cu m), forks, or a selection of powered and non-powered work tools. 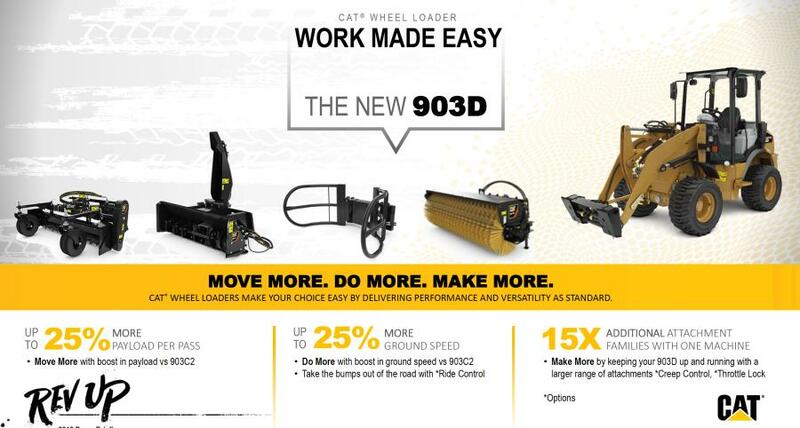 The new 903D's power train uses a fuel-efficient, Tier IV Final, Cat C2.4 engine, rated at 40 net hp (30 kW); hydrostatic transmission that provides travel speeds to 12.4 mph (20 kmh); and Caterpillar-designed planetary-reduction axles that are available with optional differential locks. The differential locks can be engaged "on-the-fly," allowing the 903D to respond instantly to changing ground conditions. 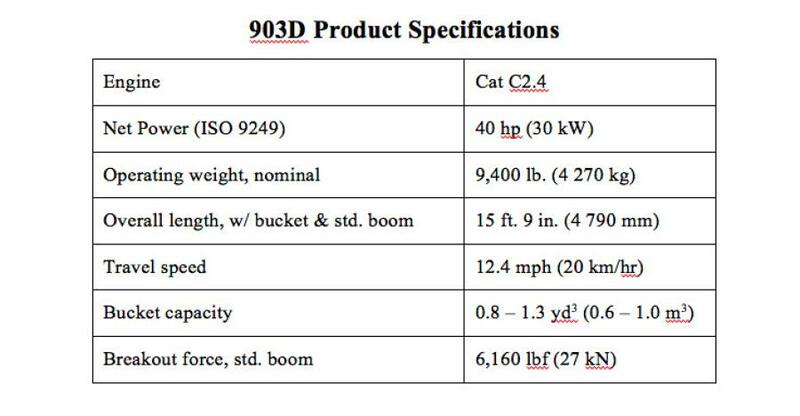 The 903D also features a standard auxiliary (third-function) hydraulic system that delivers a flow of up to 14 gpm (52 Lpm) at pressures to 3,481 psi (240 bar), producing ample hydraulic horsepower to operate any number of hydraulic work tools such as brooms, power box rakes and grapple buckets. To facilitate the use of an expanded range of work tools, the 903D is equipped with a standard universal coupler, with an optional electrically activated coupler available for switching attachments from the cab. Auxiliary hydraulic lines with quick connectors are standard, and continuous-flow allows powered tools to be easily controlled. Loader linkage for the 903D is the Z-bar type, providing both aggressive bucket-digging ability and efficient control in fork applications. Boom arms are available in both standard and high-lift configurations, with the latter increasing hinge-pin height from 10 ft. 1 in. to 10 ft. 7 in. (308.6 to 322.7 cm). 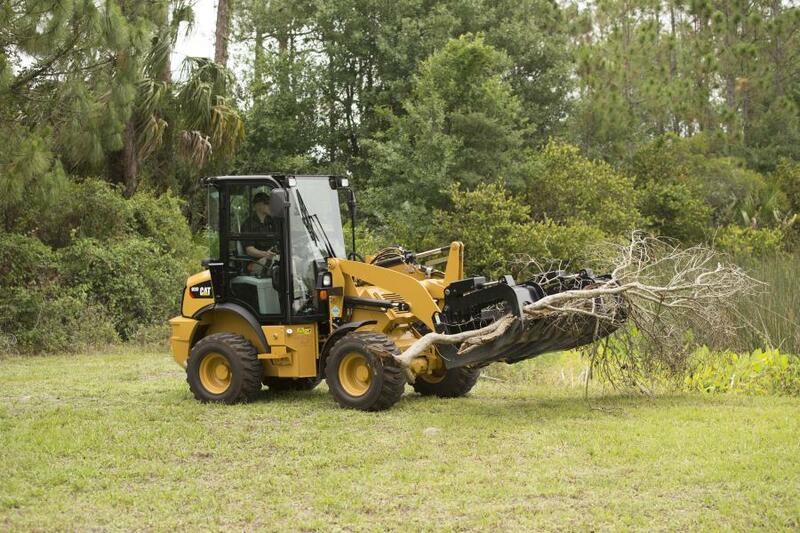 Standard features for the 903D's loader linkage include boom-float and return-to-dig functions.